Geo-Print Midi Skirt and Green T-Shirt. 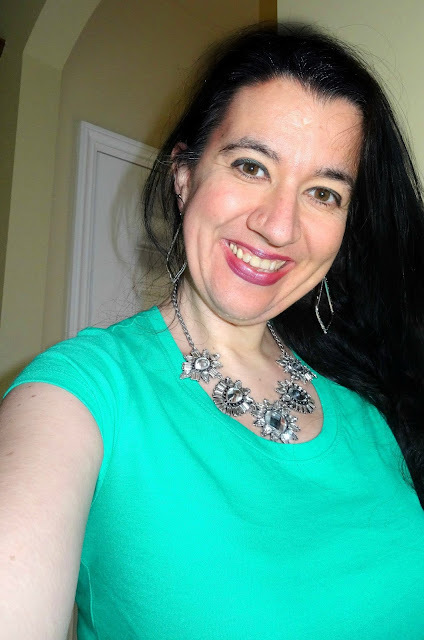 In honor of two years of Thursday Moda and in honor of Saint Patrick's day coming in 5 days, I pulled out today's outfit from the archives because it is a good one and I am wearing lots of green! 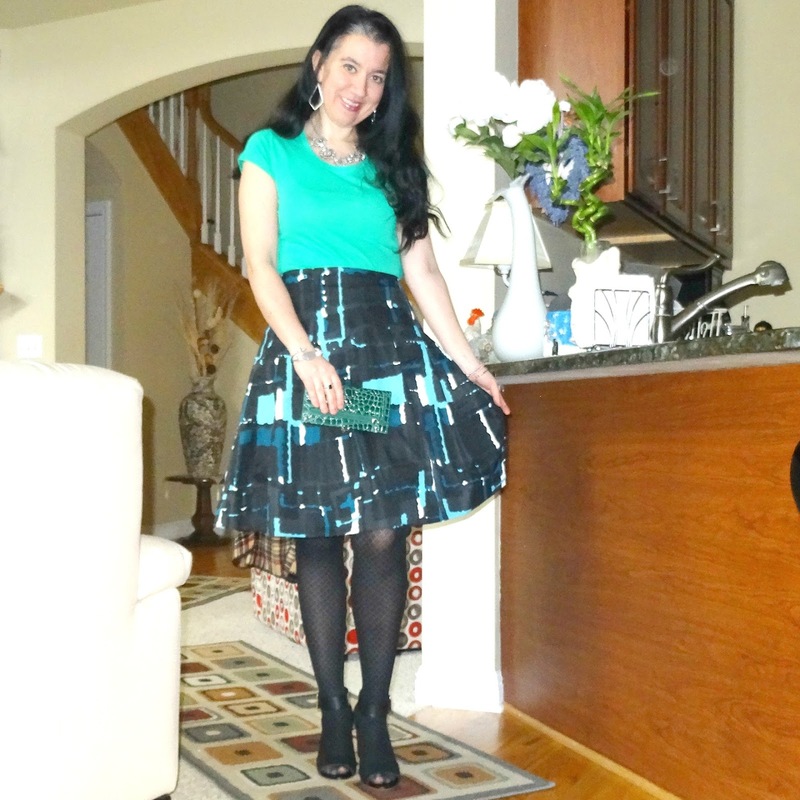 What do you think of today's outfit as an option to wear for Saint Patrick's day, to work? I am sharing today's look because again A] I have been busy and I haven't photographed or worn many outfits wearing green (one of my favorite colors to wear, by the way); B] this is one of my very first Thursday Moda posts from 2 years ago when I started my fun style linkup and 3] I figured since it is a cute dressy work look (just like my most recent Saint Patrick's Day, Work Dress which you all loved) and at least half of new are now new readers+followers to my blog, I figured I'd pull this outfit from the archives and re-post it. I have had this Silk Shantung Geo-Print Navy/Teal/Aqua/Black Midi Skirt from Express for about 10 years now. It is a great skirt in a classic and feminine silhouette and a great modern pattern. 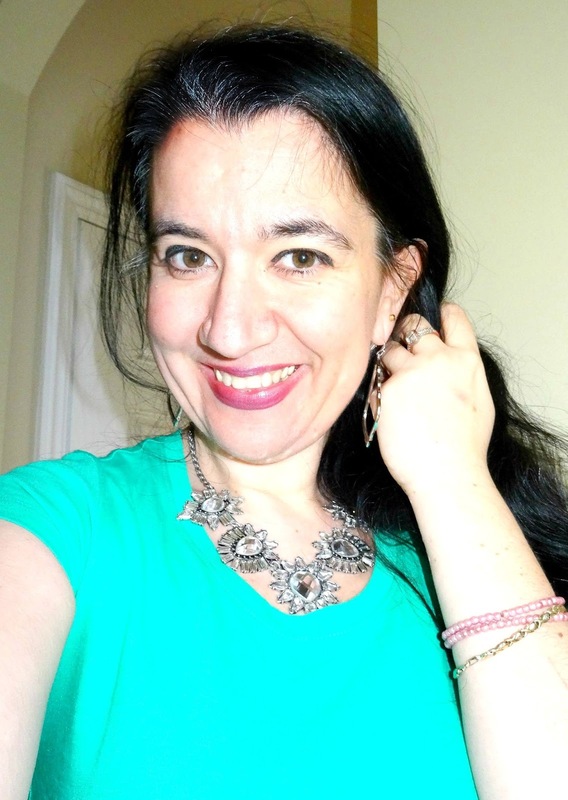 I paired it with a $5.00 Scoop-Neck Kelly Green T-Shirt by Wal Mart and dressed it up with a Crystal Statement Necklace, Fun Dangly Silver Hoops, a couple of bracelets and my Faux Python Forest Green Mini Wallet-Clutch. Of course it was cold so I had to wear a pair of Black Tights (these ones have a diamond pattern and I still have them and wear them, at least for a little longer, because they are on their last days lol) and I paired them with my Classic Block-Heel Black Sandals which are like the best non-leather quality material (Merona from Target). As you can see my hair was very long and it had a natural wave and I was slightly bigger because you can notice it by my rounder face lol. Also, it was a lot warmer at this time, two years ago, than it is today. We have had snow flakes and very low temps here the last couple of days, but at least the snow didn't stick.